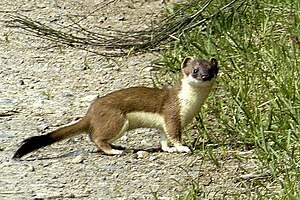 The stoat is a native of Europe and North America and is a fairly common species. Mating occurs in April to July with litters of ‘kits’ (of often mixed parentage as stoats are not monogamous) being born about 280 days after mating occurs. Males play no part in raising the young, which are born deaf, blind and covered in a fine pink or white downy fur. From being born, until about 5 – 6 weeks of age the kits have very poor thermoregulation and will huddle together for warmth. The black tips on their tail occur at about 6 – 7 weeks of age. Stoats can live for up to about 7 years in the wild but life expectancy is on average one and half years. The stoat is a carnivore and its usual diet will consist of mice, voles and larger mammals such as rabbits, even though they are usually bigger than the stoat itself! Sometimes they will even prey on snakes and lizards! Ever the opportunist they will check out every nook and cranny on their ventures, in the hope of a meaty meal. Perhaps the most mesmerizing thing you may witness a stoat do in your wildlife garden is its dance. They may perform an acrobatic display of dancing and jumping, turning and twisting in mid air like a ballet performer! However this ‘dance’ is not yet fully understood, some believe they do this to send their prey into a trance or so they the prey animal comes in for a curious closer look, then wham, whilst in their moment of curiosity the stoat will pounce! However is also believed although another reason this ‘performance’ is that of the skrjabingylus infection. Stoats require places to hide in, such as rocks and crevices so make sure your provide these in your garden if you wish to attract stoats.